Sometimes big corporates do the right thing by the little guys. Sometimes this goes unnoticed and that’s totally fine as well. I had never heard of Jetstar’s Flying Start Programme until about 3 months ago when I was extremely humbled to have been invited to join the judging panel. We convene quarterly to deliberate and award a deserving community group or organization a massive $30,000 grant ($15,000 cash and $15,000 travel) to help them keep on trucking and spread the love amongst more and more kiwis just like you and me. This quarter, we couldn’t go past the opportunity to help kickstart Hearing Dogs New Zealand’s pilot programme ‘Companion Dogs for Children’. 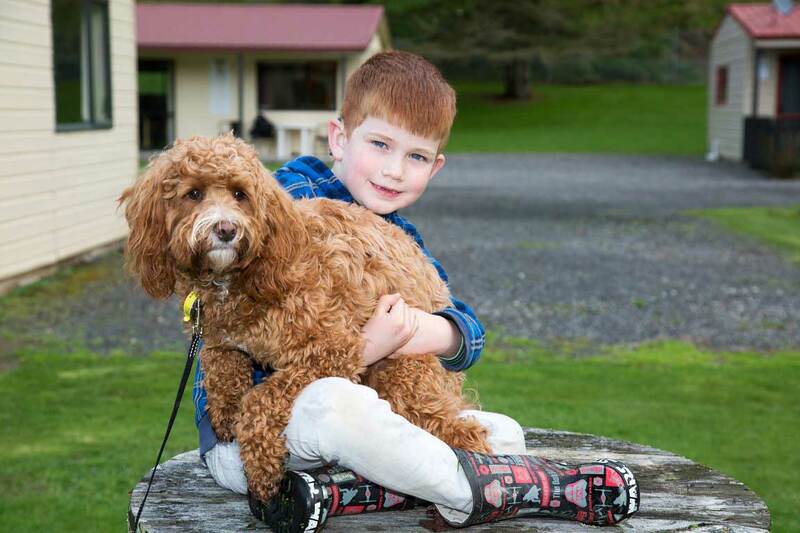 One in ten New Zealanders is deaf or hearing impaired and Hearing Dogs New Zealand delivers the important service of training assistance dogs to aid and guide them. Five and a half year old Tom Wilkinson from New Plymouth was one of the first recipients of the ‘Companion Dogs for Children’ programme. I had the pleasure of chatting to his mum Jo last week and finding out what life is like for a hearing impaired child and just how a companion dog can make a huge difference to a little person. Mum Jo describes five and a half year old Tom as a cheeky wee fellow who’s as full of mischief and fun as most other kids his age. The not so obvious difference is that Tom was born profoundly deaf. This is often overlooked as he’s incredibly articulate, but without his two cochlea implants Tom can’t hear a thing. I was completely unaware that dogs can be trained to assist the hearing impaired. Tom’s Dad initially heard about the Companion Dogs for Children program and after finding out about the many ways in which a companion dog would benefit Tom, the family signed up for the program. Initially Tom’s young dog Albert (a silky cavoodle) would visit the family home during weekends as part of his training. The two continue with ongoing soundwork homework now that Albert has been placed permanently with the Wilkinson family. When I asked Jo to describe some of the day-to-day challenges faced by Tom, she mentioned something I had never considered; though Tom’s implants mean he can hear and function in the classroom and in other social situations, all sounds are transmitted equally. What this means is chalk on the blackboard, a discussion at the back of the classroom and his teacher talking are all reaching Tom at the same volume. Simultaneously. Can you imagine? With no ‘filter’ so to speak, the processing required for Tom to meaningfully listen is exhausting and requires massive amounts of concentration. Albert is trained to assist Tom in situations where he cannot rely on his implants. During the night for example, Tom removes his implants so will rely on Albert to notify him of a fire, an alarm or any other disturbance which would reach him aurally. Albert is also being trained to respond to sequencing cues to assist in communication. For example if Jo needed to alert Tom to to something she will call Albert and say “Go to Tom”, once Albert has reached him, Tom will say to Albert “Where is it?” and Albert will lead Tom back to Jo. How awesome is that! I can’t wait to hear more about how Tom and Albert develop their relationship and further their training together. In the meantime, if you would like to find out more about the Hearing Dogs New Zealand program head over to their website www.hearingdogs.org.nz where you can make a donation. These guys receive no government funding so public donations and programmes like the Jetstar Flying Start grant help keep them running.